When searching for Maine lakefront land for sale you should investigate the possibilities in Lincoln, Maine. The town is known around the world as a producer of the world's finest quality napkin stock. What you may not know is the town is home to more than a dozen lakes and ponds. Lincoln's lakes are very diverse with some located in the downtown and busy areas of towns and others with little development remotely located in its timber landscape. Some of the ponds are great places to paddle a canoe or kayak while others are perfect for power boating, skiing swimming. The fishing ranges from trout and salmon to large and smallmouth bass. The lakes here are often connected in chains or by small to large streams. A trip to Main Street in Lincoln will offer a view of Mattanawcook Lake from the town maintained public gazebo. The lake has a quality boat ramp and is a popular place to boat in the larger basin of the lake. The upper,more shallow section of Mattanawcook is terrific loon habitat with several pair of loons nesting here every year. Lakes that feed into Mattanawcook are Crooked, Folsom and Upper Ponds. These three ponds are much more remote and have little development around the shores. East of town you will find the three lake chain of Caribou, Long and Egg Ponds. These are set at the base of Rollins Mountain and are heralded as top quality bass water. Boating is good with access from one lake to the next. A boat launch is located on Long Pond just off Sweet Road. North of downtown you will find a couple of small but quality ponds like Comballassee and Snag/Stump Pond. Both of these ponds are excellent fishing and paddling places which offer the small boat enthusiast a quiet place to be. 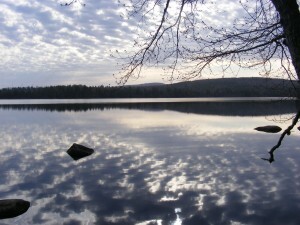 The trout and salmon ponds of Lincoln are located to the southeast with Cold Stream Pond (CSP) being the premiere lake with over about 3,000 acres of surface. CSP has depths in excess of 100 feet with crystal clear water perfect for all watersports. The large lake is fed by the three trout ponds. The remote and undeveloped Little Round Pond and the two Upper Cold Stream Ponds (known locally as the Big and Little Narrows). 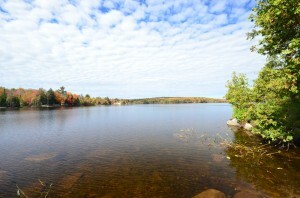 These two smaller lakes are well developed with cabins, camps and year round homes. If you are just starting your search for waterfront property for sale in Maine, come see what the Lincoln Lakes have to offer. You will find that land prices are affordable by lakefront property standards and the town has much to offer once you are off the water.